View of the Institute’s iconic central plaza looking out towards the Pacific Ocean. The Fall 2016 edition of The Getty magazine, the Getty Conservation Institute (GCI) reports on its partnership with the Salk Institute for Biological Studies in La Jolla. Its campus, designed by Louis Kahn, is widely considered to be a masterpiece of modern architecture. The GCI has lent its expertise in addressing the aging and long term care of one of the Institute’s major architectural elements—the teak window walls set within the buildings’ noble and monolithic concrete walls. 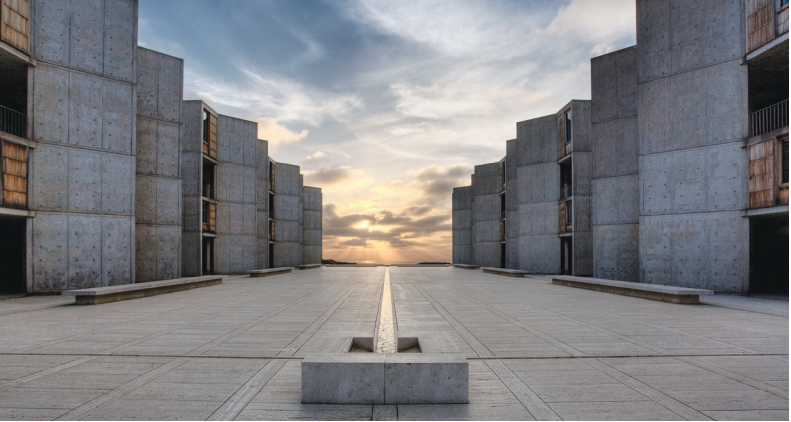 The Salk Institute is also a recipient of a “Keeping It Modern” grant from the Getty Foundation, and a comprehensive conservation management plan for long-term care of the site. This summer, The Salk announced the completion of its $9.8 teal window remodel. To view the earlier article on the Salk conservation project CLICK HERE.